As we kick-off another school year in North America, we need to reset our routines. Folks often ask “how do you get organized for the school year?” or “help me organize my student”. Here are simple tips to help students manage time, avoid clutter, set goals, and stay on an organized path to a successful school year. No one likes to feel rushed. It is a process to bathe, dress, eat breakfast and get everything together for the day, Make sure your child wakes up early enough to arrive at school well ahead of the start time. If your child will bathe in the evening, you gain spare time in the morning and some extra minutes of sleep. If your child bathes in the morning, and they need at least 30 minutes to get up, shower, dress and eat breakfast, pad that time by waking them up at least 45 minutes prior to their departure. This will avoid rushing, arguments and stress. Before bed each night, help them choose and lay out their clothes for the next day. This way, you’ll avoid arguments and they’ll be all set to dress and go in the morning. 3. DO A NIGHTLY REVIEW. Each evening spend 5 minutes with your child reviewing their upcoming activities. Determine what needs to be done to prepare. In doing so, they will know exactly what they are expected accomplish the next day. A good night’s rest is essential for students. This will ensure they are alert and ready to learn the following day. 5. EAT A BALANCED BREAKFAST. Students should eat three healthy meals each day, along with fruit or veggies for snacks. Studies show students who start off with a healthy breakfast had higher energy levels and better learning ability than similar students who did not eat breakfast. Harvard researchers found that students who ate breakfast were “…significantly more attentive in the classroom, earned higher grades in math, and had significantly fewer behavioral and emotional problems.” Avoid overloading on high sugar sweets, which cause many people to feel tired. 6. SET-UP AN EFFECTIVE STUDY ZONE. Designate a quiet, well-lit area for studying. 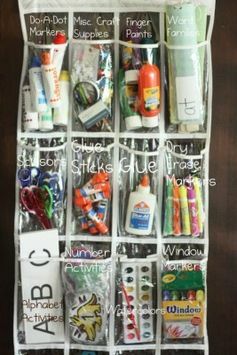 Make sure the supplies your child needs for school work is easily accessible. This could be a desk in their room, your home office or the dining room or kitchen table. During study time, minimize disturbing activities so your child can study without distraction. Don’t allow children to study in front of the television, or in an area of your home where they are bound to be distracted. Papers add up throughout the year e.g.) assignments, notices from the school, etc. Be careful not to build clutter as the year progresses. Create separate folders for school announcements, tests that have been graded, papers that must be given to parents and so on. Review your folders weekly. As papers become outdated, such as an event that has passed, toss them immediately. 8. SCHEDULE CONSISTENT STUDY ROUTINES. We all do better when we have routines. This is more important for children. They do better when they know what is expected of them. Set aside time every day for study, and make it consistent. Set a designated time for your child’s study time for each afternoon. Whatever you do, teach your child to avoid late night, last-minute studying and cramming. Break up big tasks, into smaller, bite-sized jobs. For instance, if they have to read three chapters of a book, read one chapter at a time each day. If they have to work on a project, break it down into three or four manageable stages. It is less overwhelming for the student. 10. TACKLE LEAST FAVORITE OR MOST CHALLENGING SUBJECTS FIRST. You teach children to eat their veggies before offering dessert. Just the same, your child should start their homework with their most difficult subjects first. Then, everything else will be a breeze, and you will encounter less resistance. AVOID OVER-PROGRAMMING. While you may sign up your child for extra curricular activities, such as basketball or cheerleading. Over-scheduling puts too much pressure on them and can lead to problems managing school work and activity balance. Review their course load. Determine how much study time they will need. Then, choose one or two recreational activities they really enjoy. Use a good student planner or organizer. The ones that have pocket folders, dividers and planning calendars are ideal. If your child has an iPod or smart phone, you can electronically share calendars and reminder systems. Ask yourself, does my student respond better to paper or electronic notes. Many school systems enable teachers to post homework assignments and tests online. When your child learns of an upcoming test, event, or anything they must prepare for or attend, teach them to immediately jot it on their planner and carve out study and preparation time. Use one calendar to plan all of the child’s school and personal activities, rather than two or more. When you use more than one, you run the risk of scheduling conflicts and missed appointments. Give the child one place to look for their obligations. If your child has an iPod or smart phone, you can share a calendar where you post obligations and the child can get reminders on their electronic device. You may consider color-coding your child’s similar activities on your calendar. For example, highlight all upcoming tests in yellow, study time in green and recreational activities in pink or you could do a different color for each child. This is made easy when using electronic planners. Check in with your student. Teach your child, if they don’t understand a lesson, to immediately ask for help before they get to the point where they are totally confused. A sibling, friend, parent, teacher or tutor can be a lifesaver. If you find your child has gotten off track, teach them to simply take a deep breath, find out where things went awry and get back on track. It is better to get slightly derailed, rather than giving up. Designate enticing rewards for goals your child meets, such as family night at the movies, or a quiet, relaxing walk in the park. As they achieve their goals through hard work, provide them with rewards. This will help keep incentivize them and keep them motivated throughout the year. What are your favorite tips for getting students organized? Here is to a great school year! Tagged: back-to-schoolCertified Professional Organizerchildrenclutterhelp me organizehow do you get organizedKim OserMarylandNeed Another Youorganizationorganizeorganized homeorganizerOrganizingorganizing ideasorganizing tipsProductivityprofessional organizerprofessional organizingschoolschool yearsimplifySimplify Your Lifestudentsstudy zoneWashington D.C. Thanks Olive! Good luck with your presentation. Wishing you an organized school year!